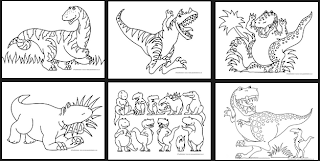 Free Paul Stickland dinosaur colouring pages from Dinosaur Roar! and Ten Terrible Dinosaurs for you to download for free and colour in. Have fun! The three files at the bottom of the page are the templates to create your own pop up dinosaur mouth. Print these out on some cardstock to make a dinosaur mouth just like the munching great green dinosaur in Swamp Stomp! To use, right click with your mouse, choose "Open in a New Tab" and then print!